The Broadway League has released its annual study “Demographics of the Broadway Audience” for the 2014-15 season on Broadway. More than two-thirds were female and, surprisingly, they see more straight plays than musicals. But things are changing. According to the 52-page report, the number of ticket buyers is continuing to grow. In the 2014–15 season, there were a record-breaking 13.1 million admissions to Broadway shows. Approximately two-thirds of those were made by tourists: 49 percent from the United States (but outside New York City and its suburbs) and 18 percent from other countries. Sixty-eight percent of the audience was female. Theatergoers tend to be more affluent than the general population: 35 percent of those surveyed said they have a household income of more than $150,000 a year, compared with less than 10 percent of Americans in general. Of theatergoers over 25 years old, 78 percent had completed college and 39 percent had earned a graduate degree. While audiences are still primarily white (79.8 percent in 2014-15), the percentage of black theatergoers has grown from 3.6 percent in 1998-99 to 6.0 percent in 2014-15. The average Broadway theatergoer reported attending four shows in the previous 12 months. The group of devoted fans who attended 15 or more performances comprised less than 5.6 percent of the audience, but accounted for 32 percent of all tickets sold (4.2 million admissions). Playgoers tended to be more frequent theatergoers than musical attendees. The typical straight-play attendee saw eight shows in the past year; the musical attendee, four. • Word-of-mouth continues to be the most influential factor in show selection: 45.8 percent said they bought a ticket on the basis of “personal recommendation.” In second place (13.6 percent) was “like the music.” In third place (19.0 percent) was “like the movie.” The factor “critics review” was only fourth place (16.0 percent). It was followed by “to see a particular performer” (14.3 percent) and “it received Tony Awards or nominations” (11.6 percent). • Broadway audiences are continuing their shift to the web. While only 7 percent of theatergoers bought their tickets via the internet in 1999-2000— a distant third place behind phone and box-office sales— more than 50 percent did so in 2014-15, putting web sales far and away the top method for buying tickets. 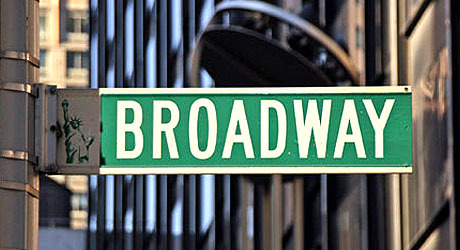 The average reported date of ticket purchase for a Broadway show was 36 days before the performance. Domestic tourism to NYC continues to grow and has been growing steadily since 2009, and is reflected in growing domestic audiences on Broadway. There was a small dip this year in international tourists. Using the above as background there is no clear lines and or methods of advertising within the Black communities throughout the entire United States. Most Black people don’t read playbill.com. When a new movie is coming out the advertisements are blasted via all modes of advertisement ( I.E.TV, WEB pushes, and door to door advertisement’s). However, did you know, Color Purple and Hughie Starring Forest Whitaker are on Broadway NOW! Additionally, Oscar Winner Lupita Nyong’o is coming to Broadway starring in “Eclipsed”. Unchain My Heart, the Ray Charles musical that had been scheduled to begin previews Oct. 8 at the Ethel Barrymore Theatre, will now open on Broadway in spring 2011 at a Shubert theatre to be announced. The principal cast is expected to stay with the production. Producer Stuart Benjamin cited logistical reasons for the change in date. The cast is scheduled to feature Brandon Victor Dixon as Ray Charles and Nikki Renée Daniels as Della with Harrison White as Jeff Brown and Tasha Taylor as Margie Hendricks. Directed by Sheldon Epps, Unchain My Heart features the music of Ray Charles and a book by Suzan-Lori Parks. The creative team also includes choreographer Kenneth L. Roberson, associate choreographer Edgar Godineaux, music supervisor and arranger Rahn Coleman, orchestrator Harold Wheeler and music director Shelton Becton. The design team comprises Riccardo Hernandez (sets), Paul Tazewell (costumes), Howell Binkley (lights), Carl Casella (sound), Jason H. Thompson (projections) and Charles LaPointe (hair). It Died on the vine without explanation. Hey Buddy!, I found this information for you: "Mr. Free Spirit Talks Broadway". Here is the website link: https://blackmeninamerica.com/mr-free-spirit-talks-broadway/. Thank you.